East Jerusalem – A Palestinian in occupied East Jerusalem is breaking boundaries by suing the Israeli government in hopes of becoming the first Palestinian to run for mayor in Israel’s municipal elections in Jerusalem next month. Aziz Abu Sarah, 38, announced his intention to run for mayor last week, as part of the Palestinian-run Al-Quds Lana (“Jerusalem is ours”) list, which is contending for seats at Jerusalem’s city hall in October. Israeli law forbids Palestinians in East Jerusalem from running for the post of mayor because they are not considered Israeli citizens. Therefore, Abu Sarah has decided to sue the Israeli government in Israel’s High Court over the law. “I’m putting Israel to the test,” Abu Sarah told Al Jazeera. When Israel occupied and subsequently annexed East Jerusalem in 1967, Palestinians there were not given Israeli citizenship, but were instead issued Jerusalem residency IDs, which can be revoked by Israel for a host of reasons. Nearly 15,000 Palestinians have had their Jerusalem IDs revoked in the last 50 years, according to Human Rights Watch. If I lose, then we’re calling bluff on Israel’s claims of being a democracy. While Palestinians in East Jerusalem can vote and run in the municipal elections, they are prohibited from voting in Israel’s national elections. Abu Sarah, a resident of the East Jerusalem neighbourhood of Wadi Joz, tells Al Jazeera that there was a “very low” chance that he would win the case in the High Court. “If I lose, then we’re calling bluff on Israel’s claims of being a democracy. “This is clear taxation without representation,” said Abu Sarah, who specialises in conflict resolution and also runs a tour company. If he succeeds in the High Court, then “I hope to win the seat of mayor,” he said. Al-Quds Lana was the second Palestinian list to announce its intention to run in elections, following “Jerusalem for Jerusalemites”, headed by Ramadan Dabash, a Palestinian citizen of Israel who is running a strictly “non-political” campaign. Palestinian residents of East Jerusalem pay more than 300 million shekels (nearly $84m) to the municipality each year, Abu Sarah says, but only some 10 to 12 percent of the budget is invested back into the eastern side of the city. “Where does our money go? Our money goes to funding [Israeli] settlements,” he said, pointing out that following the establishment of a new illegal Israeli settlement in Sheikh Jarrah, the connecting road to the East Jerusalem neighbourhood was repaved and new electricity and water lines were installed by the Jerusalem municipality. Where does our money go? Our money goes to funding [Israeli] settlements. The approximately 350,000 Palestinians in East Jerusalem have faced years of neglect and discrimination in the city, which has made life unbearable for many residents. According to Abu Sarah, one of the main issues for Palestinian residents in Jerusalem is Israel’s demolition of Palestinian homes in the city. Palestinians have faced a housing crisis in East Jerusalem since the start of Israel’s annexation of the territory, when the land zoned for Palestinian construction was reduced to about 13 percent, most of which was already built up. 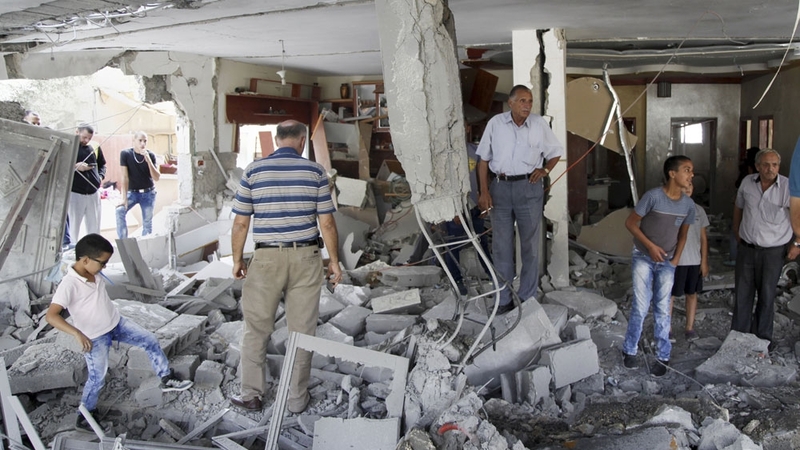 Israel’s Jerusalem municipality has subsequently carried out routine home demolitions in Palestinian neighbourhoods, owing to Palestinians building without Israeli-issued construction permits. Palestinians in East Jerusalem, 76 percent of whom live below the poverty line, are forced to pay tens of thousands of dollars for Israeli building permits, while most of the applications are nevertheless rejected. According to the United Nations, Israel has demolished at least 124 Palestinian homes in East Jerusalem since the start of the year. Palestinians in East Jerusalem have boycotted the Jerusalem elections since 1967, with less than two percent of Palestinians voting in the last election. But, “if 70 percent of Palestinians voted, we could win city hall – even without the Jewish Israeli vote,” Abu Sarah told Al Jazeera. The Palestine Liberation Organisation has encouraged Palestinians to continue with the decades-long boycott, claiming that Palestinian participation in Israeli elections “normalises” and “legitimises” Israel’s occupation and its annexation of East Jerusalem. Elections in Jerusalem often make for a tense environment, with most Palestinians who have announced their intent to run in elections in the past withdrawing after being threatened or intimidated by Palestinian nationalists. Abu Sarah recently had eggs thrown at him by a group of young Palestinians, who accused him of being a “traitor”, while he was giving a speech outside city hall. When all you do is boycott the elections, you’re doing Israel a favour. Nevertheless, a recent poll suggests that at least 30 percent of the Palestinian population in Jerusalem is considering voting. Meanwhile, Abu Sarah believes his election run is the “opposite” of normalisation. Palestinians in Jerusalem engage in various forms of “forced normalisation”, Abu Sarah added. Abu Sarah highlights that, according to international law, participating in municipal elections does not mean that the occupied have accepted the occupier. He noted that under British occupation in the 20th century, the mayor of Jerusalem for almost 14 years was a Palestinian Arab – Raghib al-Nashashibi. For Abu Sarah, the most important aspect of his campaign is demanding the conditions that would allow Palestinians to remain in Jerusalem. Rights groups and Palestinians have long discussed Israel’s goal of creating a large Jewish majority in Jerusalem through the systematic expulsion of Palestinians from the city. This is done in various ways, according to rights groups, including revoking Palestinians’ Jerusalem residencies and making life too difficult for many to stay in the city. Owing to poverty, discrimination and the soaring cost of living in Jerusalem, many Palestinians risk losing their Jerusalem IDs and move to the occupied West Bank to avoid the harsh realities of the occupied city. Many also move into congested Jerusalem neighbourhoods on the other side of Israel’s wall, where prices are lower and the municipality does not enforce building regulations. Areas such as Kufr Aqab and Shuafat refugee camp have seen a massive influx of Jerusalemites moving into these neighbourhoods over the years. For years, the Israeli government has been considering removing these areas – home to more than 140,000 Palestinians – from Jerusalem’s municipal boundaries. “Whether I win or fail, the goal is to stir the water and to start a conversation,” Abu Sarah told Al Jazeera.